It’s crazy how fast time flies when you’re having fun. 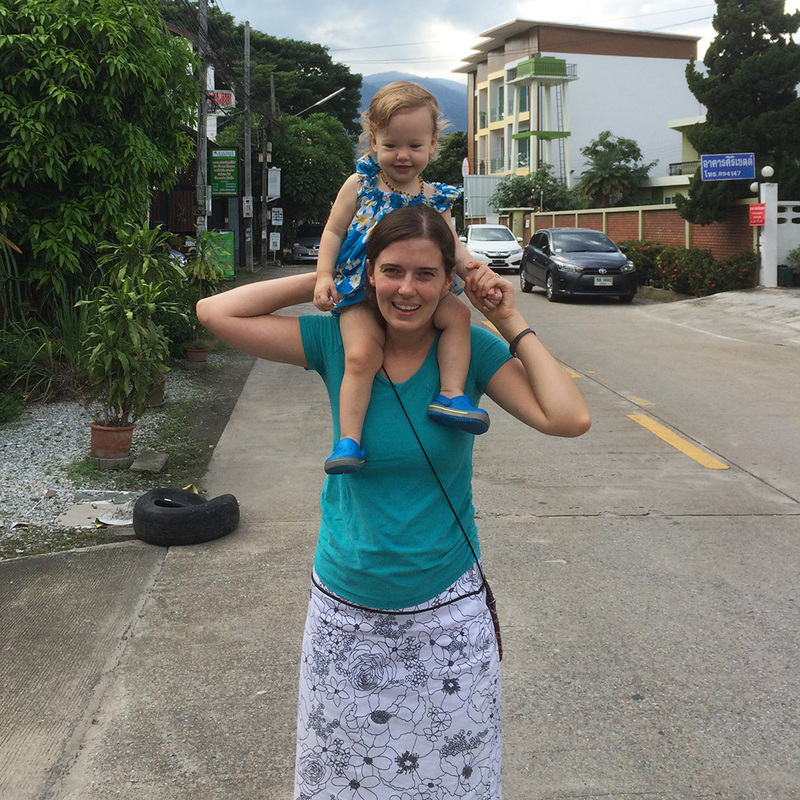 A year ago – on Olivia’s first birthday – we boarded the plane in Calgary and made our way to Chiang Mai, Thailand. Fast forward one year and we’re celebrating her second birthday in Kelowna BC, Canada. Where did time go? More importantly, what happened in the last 12 months? Here is a short and sweet timeline of what all went down. One of the beauties of missing your flight in China (due to airline error) is that they will generally put you on the next available flight and offer to book you in a hotel until that flight leaves. Most people would hate this, but after being in the air for 12 or more hours, we have always gladly welcomed the opportunity to take a nap and freshen up before the next flight. This happened to us before (when Regina and I traveled to Thailand the first time) and we were put up in Beijing for three days. Although a complete surprise and unplanned, we loved the opportunity to go see the Great Wall, some ancient tombs, and partake in a traditional tea ceremony. This time around we were delayed for only half a day – which was just enough to take a snooze at the hotel, freshen up a bit, and head back to the airport for another short flight into Chiang Mai. Side note: To be open to such spontaneous opportunities and to be able to fully take advantage of them and enjoy them, you shouldn’t write your travel plans in stone. As in, have an idea what guest house or hotel you will be staying at when you get to your destination, but don’t pre-book it. Same goes for day trips, etc. Chances are pretty good you will get a better deal anyway when you get to your destination and book these things than when you pre-arrange everything from home (no middleman). There were a few reasons we chose to go to Chiang Mai this time around. We had been there before. 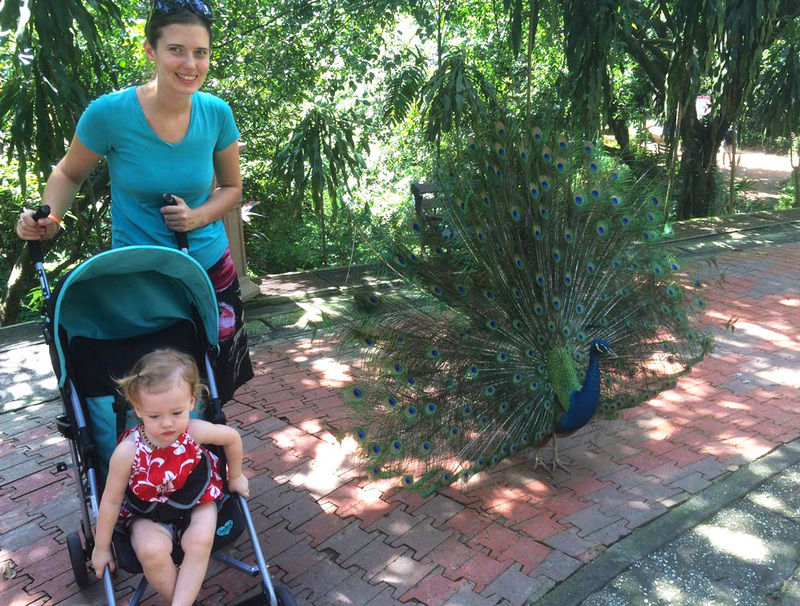 Traveling as two adults is very different than traveling with a toddler, so we figured the best way to ease into traveling with the little one is to go back to a place we had been before. Unlike Krabi (our long term destination last time we went to Thailand), we knew Chiang Mai has a major international airport. Should we ever have to go home on short notice (for whatever reason), it would be easier and quicker than from some remote island or province with limited incoming and outgoing international flights. Chiang Mai also has a couple big hospitals. Again, when you’re young it’s not really something you give much thought, but it is something you take into serious consideration if you’re the (responsible) parent of a toddler. 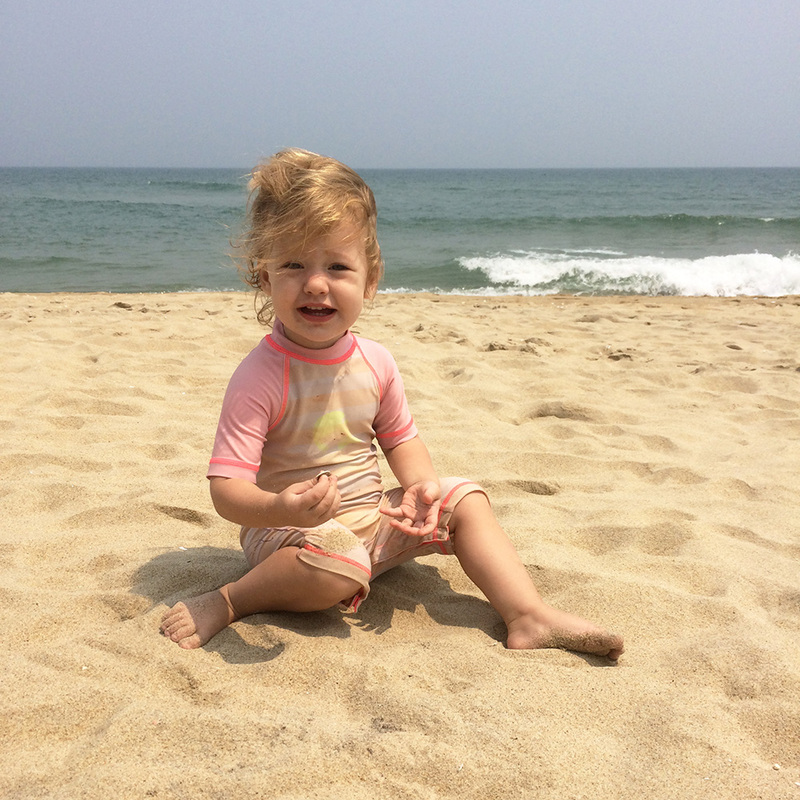 Of course you don’t go overseas expecting things to go wrong, but KNOWING what you get yourself into helps ease the “what if” questions parents tend to have (and grandparents tend to ask). We quite liked Chiang Mai. We had a 9 month tourist visa and rented a large one bedroom corner unit apartment right off with 24 hour on site security, but it was within walking distance to literally everything: DOZENS of cafes, 7-11s, bakeries, markets, street food stalls, and about 10 – 20 minute walk to two different malls. What else could one possibly want? It was perfect! I always wanted to see Angkor Wat – now a major tourist attraction in Cambodia – but we never made it on our first SouthEast Asian trip. So when the time came to leave Thailand (to extend our visa after being there for 3 months), we decided to go to Cambodia for 5 days before returning to Thailand for another 3 months. Although very friendly and hospitable, I had a hard time warming up to Cambodia. Perhaps we should have spent more time there to get a feel for things, but it truly was a glimpse of what Thailand must have looked like 20 years ago. 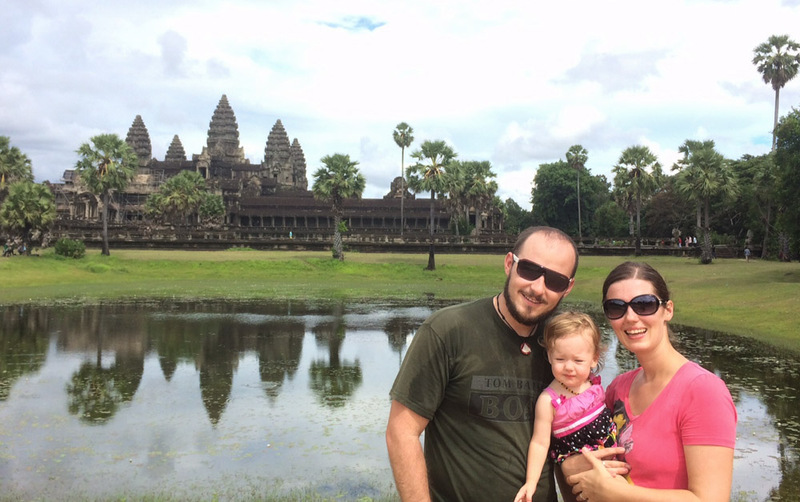 We booked a private tour of Angkor Wat through the hotel we were staying at. We’ve gone on various group tours before but never had our own private tour guide. I think we’re officially spoiled now and will always opt for a private tour instead if given an option. It was quite something. I had no idea how large and magnificent the Angkor Wat temples must have been in their day. The second time we had to leave Thailand for a visa extension, we decided to make a mini vacation to Kuala Lumpur, Malaysia. We had been to Kuala Lumpur a few times before, but had never spent much time there. We spent a couple months in Penang Malaysia once a few years ago and quite enjoyed it, but always found Kuala Lumpur a little too overwhelming. 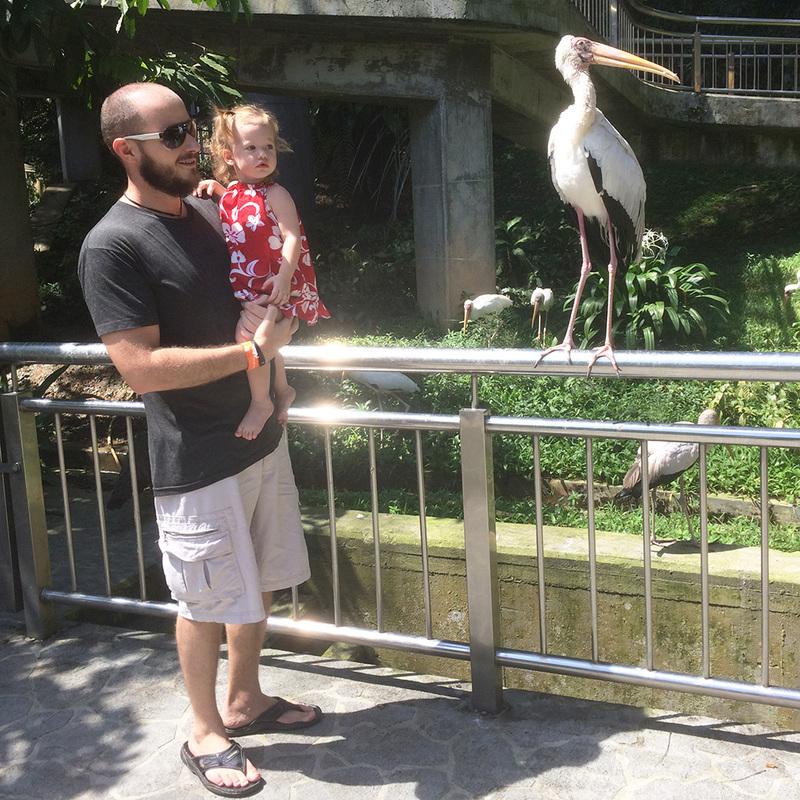 We had done the “hop on – hop off” city exploring by bus on one of our previous trips to Kuala Lumpur but never made it to the bird park. So we always said we’d have to check it out some time, so this time around we figured it would be a good family activity – something especially Olivia would enjoy. And she did! Likely my favorite part about that trip though was the hotel we stayed at. It was probably one of the tallest buildings in the city, and when booking our room, it asked if we had any preference on where to stay. Of course we said “top floor”. Which is exactly what we got: A suite on the top floor. Chiang Mai – as nice as it is – is nowhere near the ocean. After approximately 7 months in Chiang Mai we decided to take a one week vacation to Krabi, a beach province to the south of Thailand. 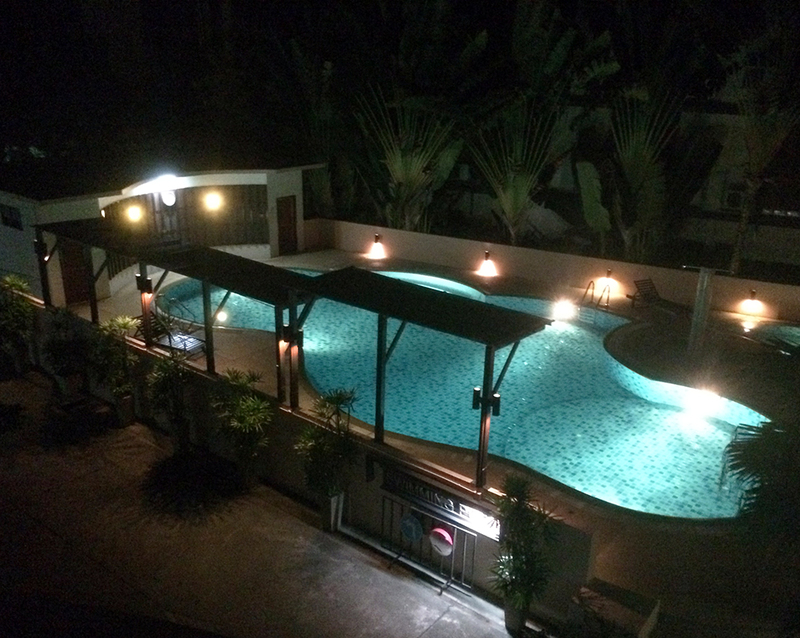 It was there where we spent 8 months in our first trip to Thailand between 2011 and 2013. It was nice. 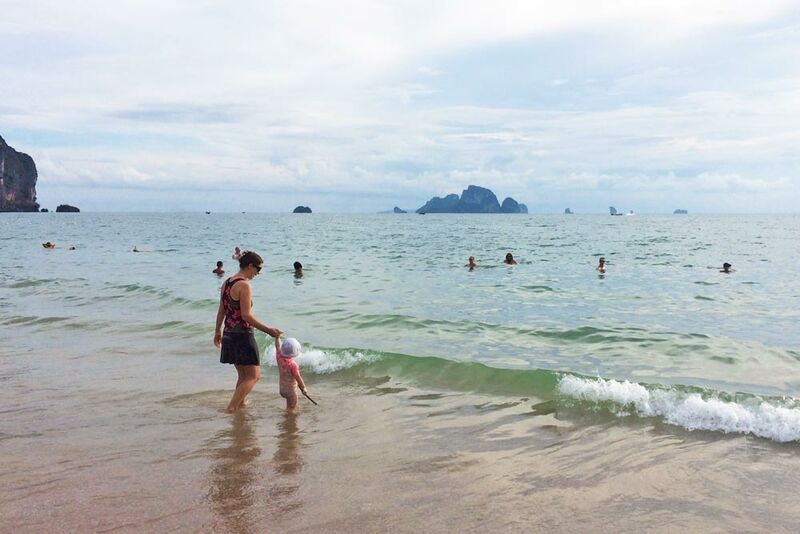 Krabi has some unbelievable islands and some pretty incredible beaches as well. Of all the things to do, we wanted to visit some of the nostalgic places we used to spend time at. One of them was a restaurant/cafe in Krabi town (Easy Cafe) and the other was a quiet (fairly undiscovered) beach. The restaurant owners even remembered us and were excited to see us despite not having been there in years. Considering how many thousands of tourists they feed every year, we were quite touched. The food and drinks were just as incredible as we remembered them. The beach on the other hand was pretty commercialized already. The forested road we used to take our scooter on to get to the beach was bulldozed away. We were quite sad to see that. Tourism seemed to have picked up quite a bit as well… almost destroying our solemn memory of one of our favorite getaway places in the world. After almost 9 months in Chiang Mai, our visa came to an end and we decided to move on. Next destination? Hoi An, a small beach town central of Vietnam. As nice as Chiang Mai was, we were missing two things: the beach, and the beach. Hoi An has some very nice beaches. Some of them only a 20 minute bicycle ride from our place. I say “bicycle” because that was everyone’s main mode of transportation. It was almost symbolic of a time gone by before any of us were even born. 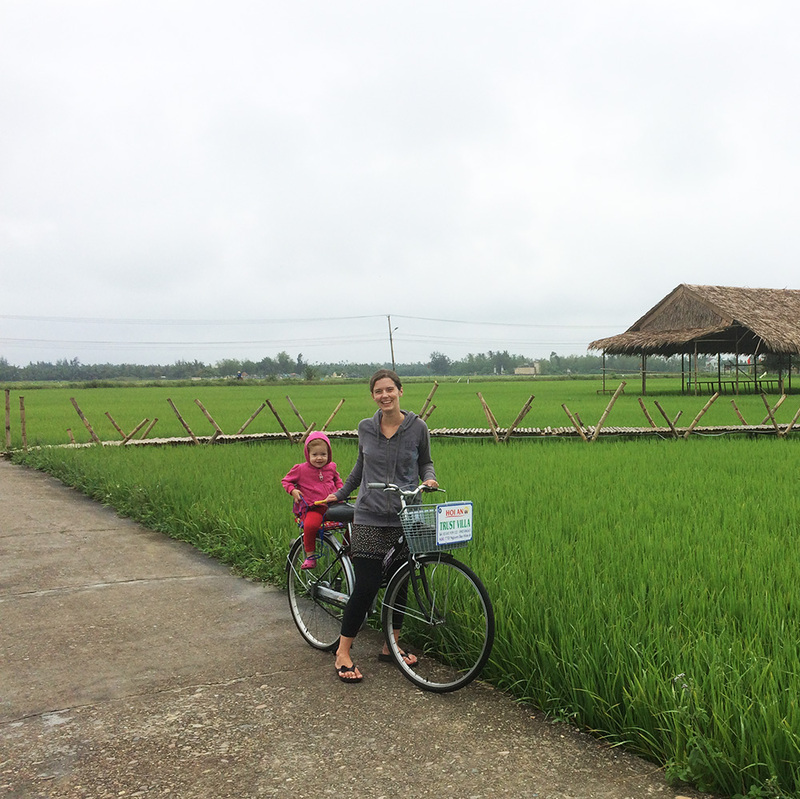 Hoi An is a small town surrounded by palm trees and rice fields. 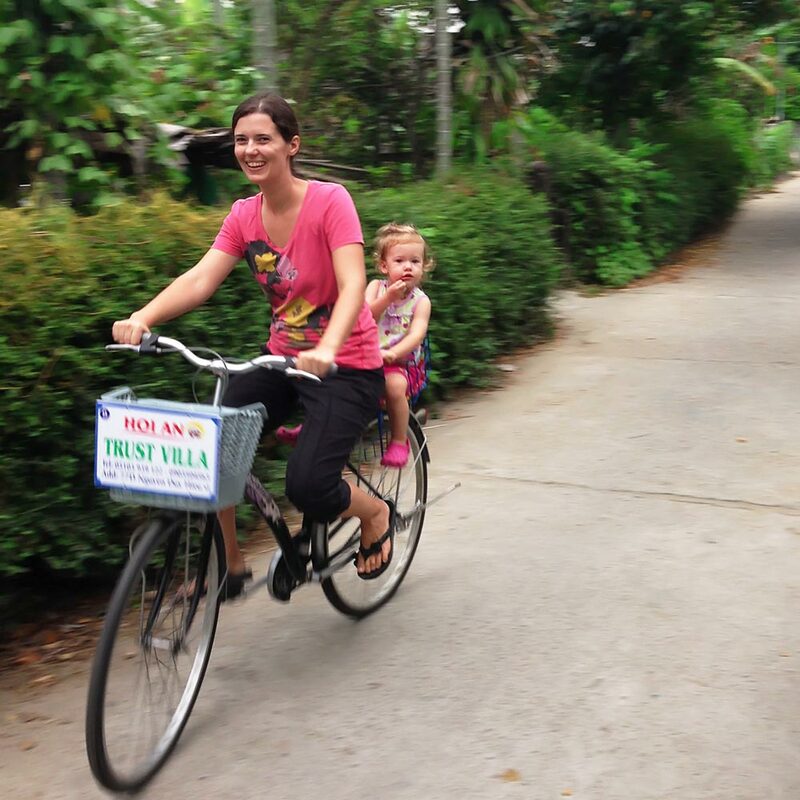 You can get everywhere by bike ($1 / day to rent) or taxi ($2 to drive across town). It’s very relaxed compared to the hustle and bustle of Ho Chi Minh (Saigon) – the capital city – where we spent a few months back in 2013 when it was just the two of us still. 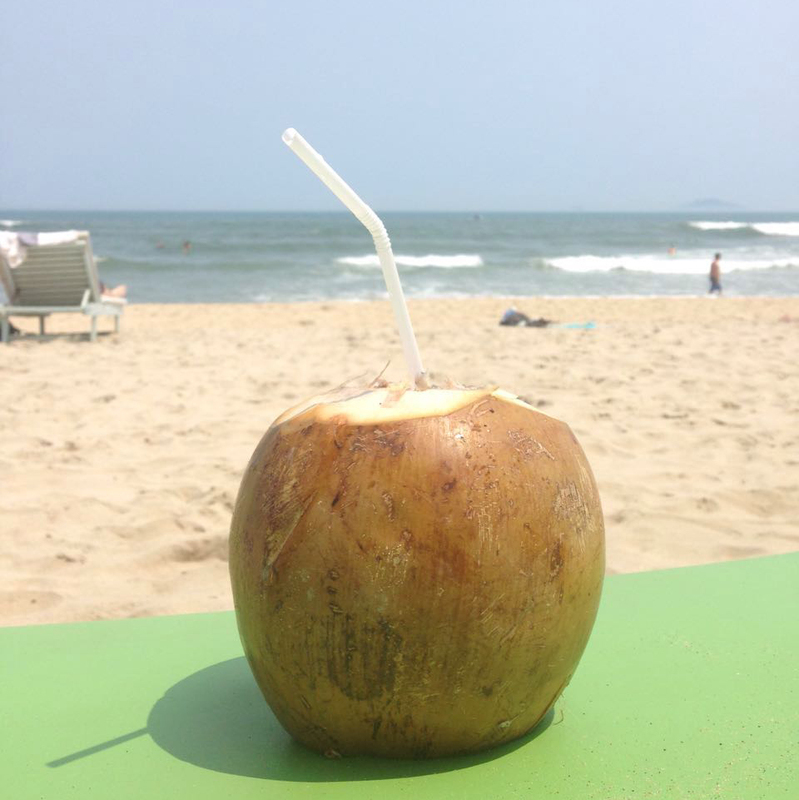 Enjoying a coconut at An Bang beach. The original plan was to stay in Hoi An for 6 months, but right as we left for Vietnam, their laws changed. Meaning – like Thailand – we would have to leave the country after only 3 months and come back in again to get a new tourist visa. Although that is generally not an issue for us (such trips force us to explore new places in other countries), we decided we might as well go home to Canada for a bit. 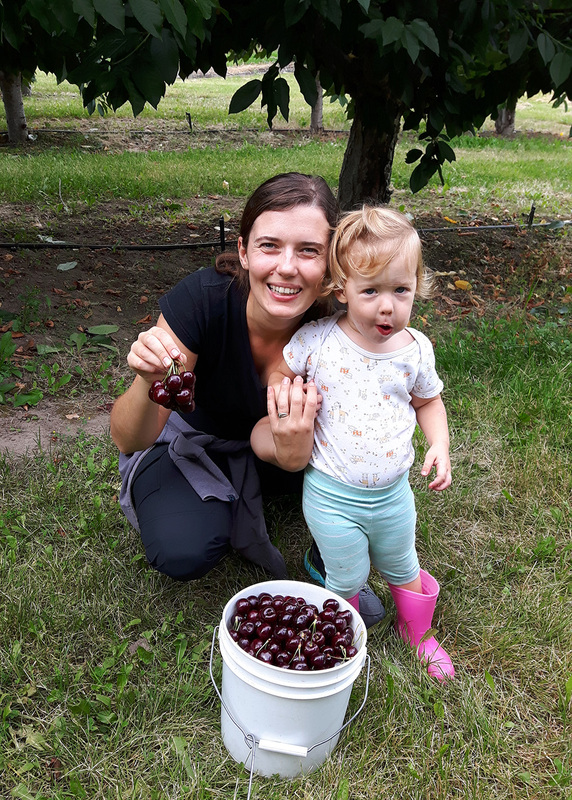 Although we originally only wanted to visit family for a couple of days in Canada before moving on to our next destination, we were encouraged by family to stay a little longer. It worked out perfectly. 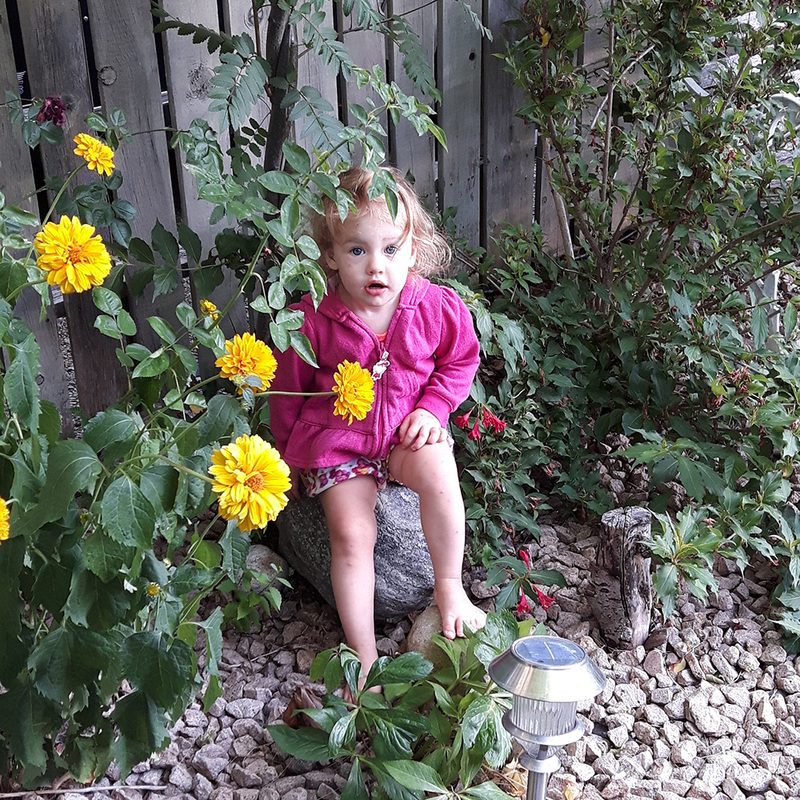 Regina’s parents – who live in Kelowna BC – were going on vacation for 3 weeks. Seeing they have a small “farm operation” going, they suggested we come and take care of things while they were gone. Regina and I looked at each other and were like “sounds like fun. Let’s do it”. 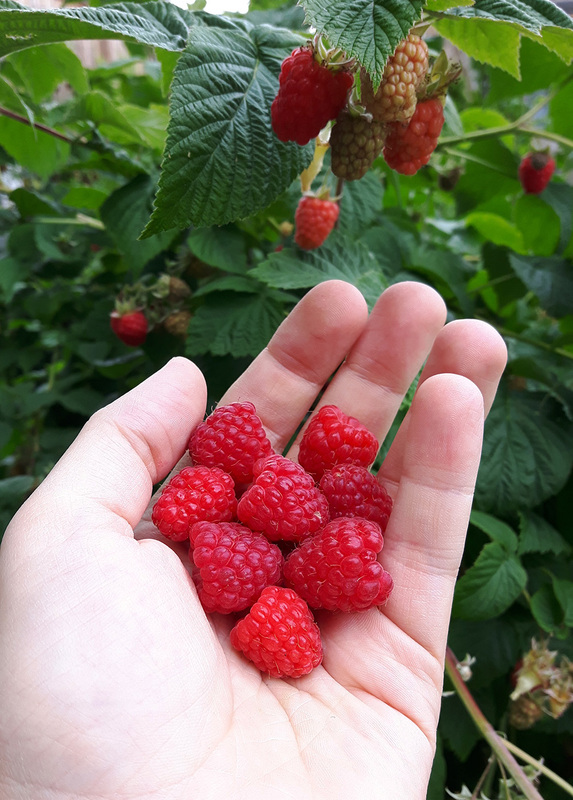 Kelowna is quite nice this time of year with all kinds of fruits (cherries, raspberries, apricots, etc) ripe for the plucking. So we’ve been truly enjoying our time here. On top of that it was nice for Olivia to get to know her grandparents, cousins, uncle and aunts a little better. She’s been having a blast! We’re off to Calgary for a week to spend some time with family (from my side) and friends. After that, we’re coming back to Kelowna for a few more days before flying out to Mexico. Although still considered North America, I’m truly excited about this next stretch of travels into Mexico just because it is the start towards Central and South America. I was born and raised in South America but know relatively little about the continent, but – God willing – that will change in the next few years. It is always my hope that I don’t share these things in a way that might come across as me bragging. Pride is honestly the last thing on my heart, but I will say: I love our travel lifestyle and am incredibly grateful that technology today enables us to do this – on an ongoing basis – WITHOUT having to find local jobs, depleting savings accounts, or even going into debt. Yes, we know of people who’ve done all three and it seems to work for them, but it would be pretty stressful for us. At least I imagine it would be. So again, us being location independent digital nomads – that can make money anywhere in the world via an internet connection – is what makes all of this possible for us. You may think we’re crazy, selfish, or even “unchristian” (as some pastor recently accused me) for traveling so much, and that is okay. We’re not looking for anyone’s approval and certainly don’t need it. I always question the alternative of what would be the more “normal” thing to do: Settle down and get a half a million dollar mortgage? Gain a ton of weight from sheer depression at some dead end job? Regularly gossip about who said what? Or complain why we’re all victims of the elite (be they religious, political, economical, etc)? Not saying settling down is bad. We’ll settle down eventually too (at least to an extent), but for now we want to travel. If given a choice, why wouldn’t you? It has allowed us to build out our online businesses while being in exotic places – renting exotic homes – living a grand lifestyle for a lot less than a mediocre to poor lifestyle back home would cost us. It has allowed us to see how small the world really is and how interconnected we really are despite being from completely different continents. It has allowed us to explore different food types and learn to appreciate them. This alone has helped us to eat healthier and more nutritious foods… which have ultimately lead to us losing a lot of extra weight while drastically improving our overall health and immune system. It has allowed us to create memories we can smile at till we’re 120 years old. Hehehe! It has allowed me to heal. Whatever happened in the past is in the past for a reason. You can’t go on being it’s victim. It came to pass – not to stay. I’ve learned to let it go and move on. It has made me realize there are two sides to every story. Instead of jumping on a “this is bad, that is evil, he is terrible, she did this” bandwagon, I want to hear the other side of the story also. There have got to be two sides to every story. It has made me realize how militant I had become because of toxic environments I nurtured from. Instead of getting emotionally riled up about anything and everything, I try to be more logical and get to the roots as to why it bothers me (or others). Quite often it is an unfounded lie we’ve been told once and kept telling ourselves ever since. I’m not saying I’ve arrived, am enlightened, or that I am superior in any way now, but am simply making a case that… hey, travelling has been good for Konrad. Heck, it has been terrific for us as a couple and now also as a family. 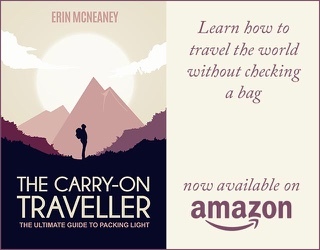 I will say “travel” has been the absolute best earthly investment I have ever made in myself and – as a result – also in the people I call my family and friends. To those who think we’ve gone off the deep end: You’re probably right. Before you think less of me (or anyone else) though for traveling or wanting to see the world, stop. Think about it. Heck, maybe even consider doing it as well. Try it for 6 months. I’m sure there are a few places you’ve always wanted to visit. Why not go and spend some time there? Go create some memories. See what it will do for you. Then come back and tell me about it. I promise you won’t regret it. Wonderfully written! My girlfriend and I are moving to South America in 4 weeks to begin our journey! I can’t wait to explore the South American continent more.